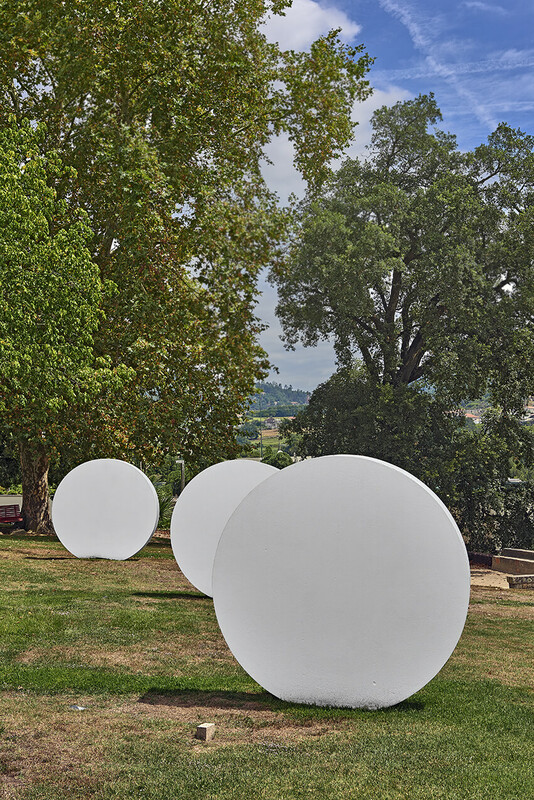 No one better than the author himself to help us contextualise his piece, set in the gardens of Santo Tirso: «I think that our relationship with nature is a fundamental part or our relationship with the world and the things around us, and that is the reason why I want my sculptures to make us think about what it means to be, to live and to use space in a rational, logical manner. When I think of philosophy, I think of the search for order in things. I am neither a philosopher nor a writer — I make forms». Mauro Staccioli was born in the Italian city of Volterra in 1937, and graduated from the local Art School in 1954. His artistic endeavour was initially related to teaching and to political and intellectual activities — in the 1960s he settled in Sardinia to teach in Cagliari, where he founded Gruppo di Iniziativa [Initiative Group], along with other young artists and intellectuals. Starting out as a draughtsman and printmaker, he shifted to sculpture in the late 1960s, paying particular attention to the relationship between art and society and pursuing a sculptural practice characterised by the use of simple shapes (circles, arches, rings), in which the pieces and their locations were tightly intertwined. Despite the similarities between Stacciolli’s formal vocabulary and that of American minimalists, he has only acknowledged his affinity with Donald Judd, due to the latter’s precision and skill regarding wood- and metal-related technologies. Mauro Staccioli’s formal coherence and simplicity to develop geometric prisms result from his need to develop what he has called an “intuitive rational” method. Thus, he tries to build volumes as if they were constructed crystals. According to the artist, «the shape of a crystal has no precise point of reference. You can measure a triangle, but a prism is elusive, it escapes measurement. One of its surfaces may seem slanting to the right, but when you get closer you see that it has moved down. There is always an element of surprise in these forms, even though its volume appears to keep a certain balance». Stacciolli has found the symbolic signs for the metaphors of his poetics and a sensible reason for his artworks within his own cultural conscience. He has always avoided the artificial and followed the stoic discipline of thinking rather than feeling, in a deliberate practice of intelligent sensitivity. There lies the essence of his oeuvre; what distinguishes and sets Stacciolli apart from American Minimalism are those archetypical cultural structures: initially, quadrilateral, cubic or pointed prismatic forms, and, later, triangles, trapezoids, circles or arcs, used as symbols leading us to the deepest senses provided by history. Nature and culture are ubiquitous in his work.